Is She Daddy’s Little Girl? If you’re the father of a daughter, I bet in your eyes, she can do no wrong? The thought of someone hurting her, mentally, emotionally or physically can send you off the deep end? You don’t want some guy coming along and breaking your baby girls heart? You don’t want some guy coming along and telling her what she wants to hear to feed his urges? You don’t want a guy coming along, making her feel so comfortable that she believes all he says, opens up her heart for love, only to have it broken? And yes there are some women that give too freely what should not be, but we are talking of guys who deliberately pull the wool over a girls eyes with the intent of getting what they want and then walking away. We are not talking of men who do fall in like and at times love with your daughter and after some time passes, realizes things with her are just no meant to be. She is your daughter, you want her treated with respect, honour and honesty, right? So why do you, the age of a man that can father a daughter treat women the way you don’t want another guy to treat your very own daughter? Young girls learn from a very young age by the men in their life, what their true worth is and way to many times, the men in their life, do not treat them the way they should be treated. Women are the keepers of the womb that bares the next generation. Women are the healers, the caregivers and need to be treated with utmost respect. If you are of age to have children but for what ever reason you are not blessed with a daughter, know that the young or older female walking down the street is someone else’s, someone else’s pride and joy, who is at that moment maybe carrying the child of the next generation, she is a woman that was once your own mother and think before you act towards her… treat all women like they are your mother, treat all women like they are your daughter and how infuriated you would be to know how someone disrespected her to fee their own needs. I have met both types of men in my life thus far and even at my age can be fooled by a sweet talker. As much as we need to teach our daughters about red flags, we need to teach our sons how to treat women. This is not a note to bash men, no, not at all. I adore men and their strengths. 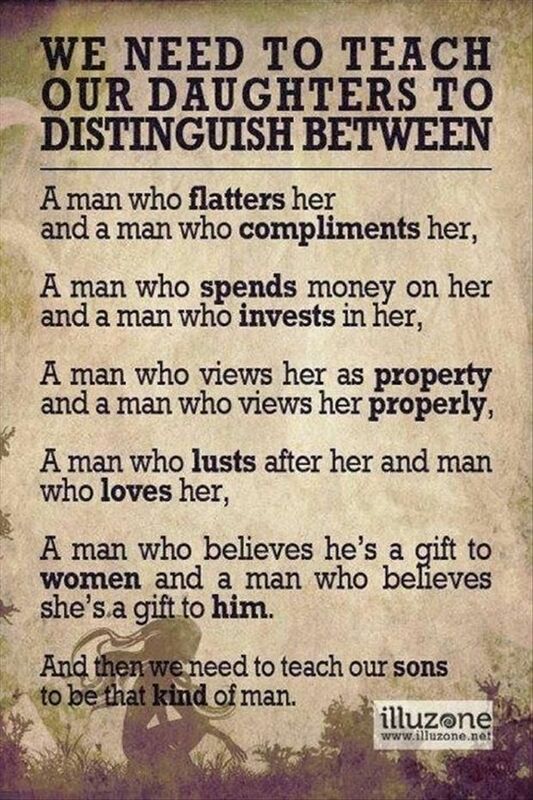 This is a note pointing out the difference between, real “men” and just some “guys”. There is a difference.